Radiant Floor Company pioneered the use of on- demand, tank-less water heaters for radiant floor heating nearly 20 years ago when many in the heating industry believed that “on-demand water heaters would never work for radiant heat”…we disagreed! We’ve been doing this longer than anyone, with great success! The Takagi on-demand water heater can be configured for OPEN, CLOSED, and HEAT EXCHANGER systems. The photos and schematics below show how it’s done. The Takagi TK-jr. OPEN SYSTEM package features dual mixing valves…one for the radiant floor, a second for regulating the domestic hot water. With this approach, the customer has the option of sending up to 140 degree water to the floor while simultaneously providing the domestic hot water fixtures with temperatures as low as 110 degrees. This T-Kjr. 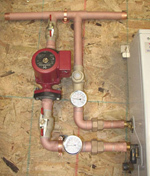 HEAT EXCHANGER plumbing package is built and soldered in our shop, then shipped in three, easy to assemble, sections. Here is a schematic of the package with all the parts labeled. Components include a temperature gauge, pressure relief valve, check valve, pump and flanges, isolation valves, pressure gauge, and copper unions for easy assembly. 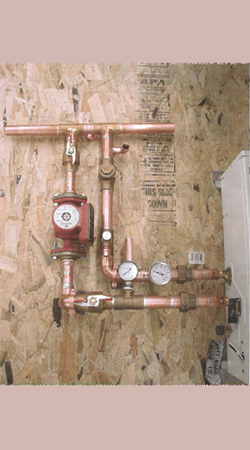 Primary/Secondary plumbing using the “open” variation. In this configuration, the Takagi provides both domestic hot water AND space heating. With the “mixing valve” installed before the domestic hot water supply, the floor and the domestic hot water can run at different temperatures. It’s hard to believe that the basic, straightforward plumbing configuration on the left (exhibit A) could be butchered into the plumbing nightmare on the right (exhibit B). This entire array…plumbing fittings, gauges, pressure relief valve, shutoff valves, unions, check valve…everything, is pre-soldered and pressure tested at our factory. The installer can literally use a crescent wrench to connect it to the Takagi in less than three minutes. 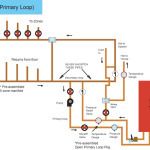 A photo and a fully labeled plumbing schematic are shipped along with the hardware to eliminate any guesswork. But, apparently, “eliminate” is the wrong word. With a stunning display of misguided ambition (see exhibit B), a licensed plumber hacked apart, reconfigured, and literally transformed a very simple, pre-engineered plumbing package into a…a…well, a…mutant alien bastardization of some medieval nightmare! Every technician in our company attempted to make sense of this photo by rotating it in every possible direction. Was this plumber trying to create a new life form? Did his customer’s home exist in some demented parallel universe where the laws of physics and hydro dynamics no longer applied? Or was our Takagi package just too simple for him? Clever guy. How did he know that we send those photos to confuse the installers? And the point of the story? Simply this: Don’t let anybody tell you that a homeowner is unqualified to install radiant heat. On the contrary, homeowners prove to us every day that pride of ownership and diligent attention to details, combined with a well engineered plumbing package, results in the most efficient and cost effective application of radiant heat. We spent a lot of time and energy designing our systems. They are simple and effective. “Improvements” like Exhibit B, well, frankly,….they probably won’t work.